"A good straight-sided bin of 1200x1000 pallet size that is stable when stacked nine or ten high," says Alvin Doak at Cirrus Plastics in Portadown, Northern Ireland of his Dolav pallet boxes. He has some 400 to store granulated polythene used to make polythene film and bags. Because they stack so safely, Cirrus Plastics does not need a racking system - a welcome cost saving. Cirrus Plastics has been manufacturing since 1987 for customers mainly in the UK and Ireland, especially in the food industry and is fully BRC accredited.Cirrus products include 'Dolav liners' widely used on pallet boxes of all types. That means Alvin Doak and the 50-strong team at Cirrus Plastics know a thing or two about plastic pallet boxes - and of all of them, they selected the Dolav for Cirrus Plastics. In each Dolav box Cirrus Plastics holds 300 kg of granules. At ten high that has a bottom load of 3000kg, which is well within the rated tolerance of 4000 kg bottom load. The polythene granules come from the first stage in reprocessing the inevitable five percent scrap and waste from production runs of polythene film and bags - but nothing is wasted. All of this by-product is granulated and poured into waiting Dolav boxes. 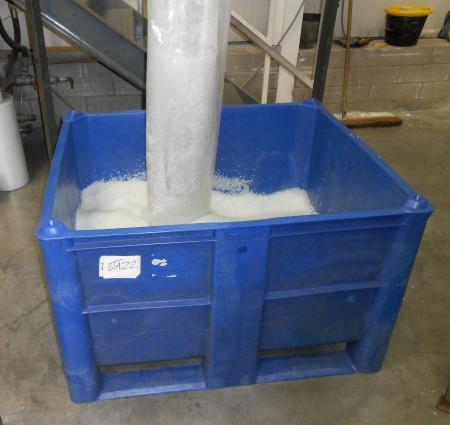 It is then stored until time for use when operatives, using forklift trucks, bring it to the polyethylene extruder. Nothing wasted! Plastic recycling granules stored and used in the next production run. In this excellent 'recycle and reuse' manufacturing process even the Dolav containers are recyclable. Made from HDPE, end-of-life Dolav boxes can also be granulated and reused in the production of new Dolav plastic pallet boxes.